Today’s Tease…Jackie Sonnenberg | authorteasereadings Making Naughty Nice! Link to purchase your Book: This will be on Amazon and Barnes and Noble online at its release in September, but also I will be selling some copies with other freebies on my website at a discount price: www.jackiesonnenberg.com Readers will get a physical book copy along with Reader Discussion Questions, Facts and Trivia Page, and a never-before-seen excerpt from novel #2. This offer is only good while supplies last. JS: I can’t say I have a literary influence either. I liked different things from different authors and just let them inspire me all together. JS: I think if you get your start as Indie, first of all, it’s not a bad start! Most publishers don’t want you unless you are published anyway, so if you decide to try to go Mainstream you’ve already got a history. Second of all, if an author is Indie and then just says Indie, it’s not bad either. Either way you are getting published with the ultimate goal of getting your name and your work out there and ensure that it is not only widely received—but you are ultimately happy with the routine and results. I anticipate seeing my career launch to a good place and eventually, advance up to a new level. I think writers of all kinds anticipate “leveling up” or taking their careers to a better place, wherever that may be. JS: The book cover is the same—whether you see it online or see it physically in a book store. It’s that first look at the cover art and the title that creates an interest in the reader. It has to be a reflection of what is on the inside. JS: Oh yeah, started since I was literate! I remember after reading one of my very first books, I flipped over to the back cover and saw the author’s name. I knew it my head that this was a grown-up that wrote this children’s book and I remember thinking how simple it was, there was not really that much to the book at all. I had a vain moment thinking that I could do better. If this grown-up could make this story and turn it into a book, then I could do the same. I just stared at the name on the cover and thought to myself that my name could go on a book as well. Then after that, I just started to write stuff. JS: The main point of a book is a central conflict of sorts. It doesn’t have to be huge, it doesn’t have to be confrontational good people versus bad people, most of the time it’s subtle, but it’s always there. I like seeing how characters are in certain situations, unique situations, and how they come out of it and most importantly, how it changes and grows them as a character. People want to see other people triumph and they always want to know what happens next. JS: I honestly don’t know, they just sort of come to me. If I am thinking about something in particular, I’ll brainstorm for a while to see where the idea takes me, and then I continue until I have some pieces in place that could work for a story. They say sometimes that “books write themselves,” and that is actually true! I’ll be writing a scene with a certain idea of where it’s going to go and then it will go beyond that and more. I understand the “whole movie” part where you just see it and then you’re just flying over your keyboard! JS: Absolutely! Generally I work on multiple things at once. I’m writing more of my second novel, which has a dark spiritual twist to it, as well as outlining several books for a series I am really excited for. JS: All That Glitters will be my fourth published book, but it is my first novel. The first three I wrote and published were non-fiction requested topics. I prefer fiction and was always writing something in some shape or form, whether they be short stories or stories that could be longer. I wrote my first actual book in kid years, but recently decided to take it in another direction and completely rewrite it into something different, so I don’t know if that counts or not! JS: Both! I think every author writes because they love it…but also because they want that to be their life. They want to be successful and want to use what they love to be able to support themselves. That can’t be that much to ask for, can it? JS: Yep, everyone has. It is unavoidable and it happens from time to time. You’ll be thinking of a scene, clear as day, when you’re away from your desk and doing something else and when the time comes to sit down and write it, you draw a blank. Sometimes I’d just make little notes on what I want to happen and come back later to see if my mind flows better. It sometimes helps to re-read certain chapters or sections to remind you of what is going on and what you are leading towards. JS: I would love that! I always dreamed of seeing my stories up on the big screen. I’d be very interested to see what people would do with it and what actors would play the parts. Not to mention it would be a project I would love to be a part of and a new fun experience to have! I would probably even ask to get a cameo or walk on part! A lot of authors have had their work made into films and were in fact not happy about the results, such as Roald Dahl flat out hating Willy Wonka and the Chocolate Factory (the 1971 version, the version with Johnny Depp would be more up Dahl’s alley!!) and P.L Travers having many disagreements with Mary Poppins. With book to film there are of course going to be changes here and there, and while it would be hard to see your own work changed in any way shape or form, I would try to be open minded. I would enjoy it! Thanks for that fun and fabulous interview JS…Now… for the fun stuff! Favorite Beverage? I’m an avid tea drinker! I think I drink too much. Exercise or Bubble Bath? Bubble Bath. I’m so lazy. Favorite Food? Pasta. Macaroni and Cheese is my true love. Favorite Song? Too many to name! Favorite Movie? 3 way tie between The Goonies, The Nightmare Before Christmas, and Coraline. JS: I’d take a big group of friends on a tour bus around Europe! It would be so fun to just travel and see things, and not have to worry about our different schedules and daily routine, and just plain have fun. Jackie Sonnenberg is an author living in Chicago debuting All That Glitters in September of 2013. 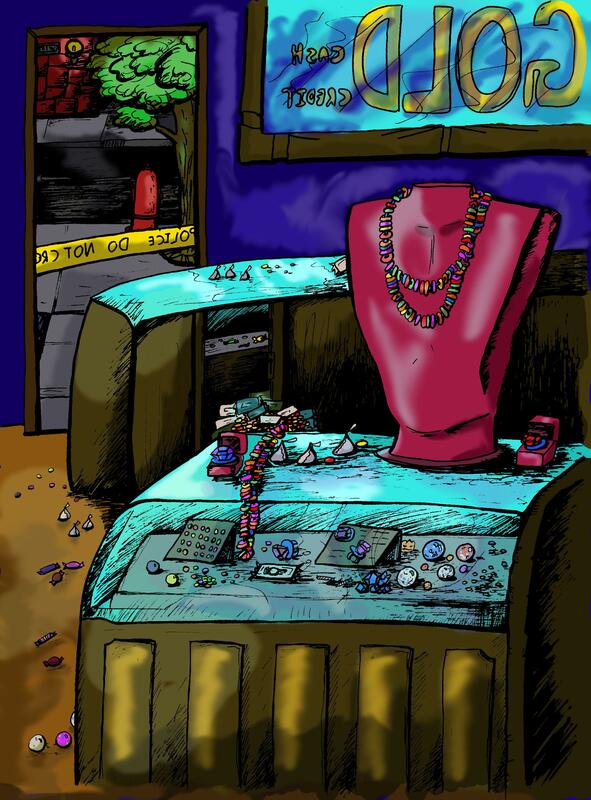 In All That Glitters, a jewelry thief with the ability to get by undetected is on the hunt for something special. The only trace he leaves behind is candy in place of what he steals…the media dubbing him “The Candy Caper.” He won’t give up until he finds his special item said to be blessed with ancient magic…but what does he want with it? And what if someone else gets in his way? Visit www.jackiesonnenberg.com for more and “like” Author Jackie Sonnenberg on Facebook. 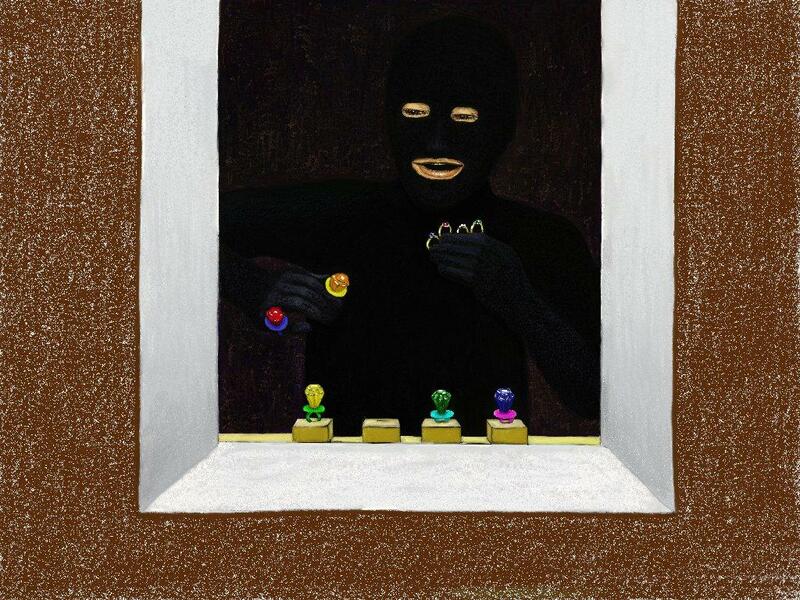 She would also like to thank Matt Lyons for the colorful store scene and Claire Roberts for the picture of the thief! Great job guys!